Thanks to all those who have subscribed and posted their Kills in the members forum. We have had some seriously deranged suggestions which is what I am after. 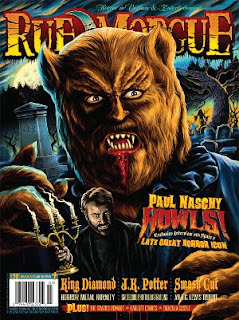 Check out Rue Morgue magazine's March issue to see a feature on my latest Horror flick and keep those Kills coming! 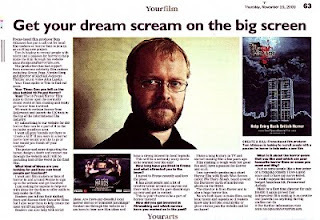 The Create a Kill campaign is off to a great start with features in The Independent newspaper and Bizarre early this year. Watch out for more like this in the press in 2010. Join now to hear more about my recent Horror production The Hairy Hands which is now completed and screening in the Chicago Horror Festival! Clips will be posted in the members area soon. If you had to die in a Horror movie how would you choose to go? Bleed to death in a basement or burned alive? If you were a crazed killer who would you kill and how? 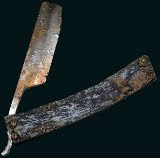 Bash their brains in with a pipe or gut them slowly with a blunt razor? The 10 Pound Horror Film wants all you Horror hounds out there to Create a Kill! Subscribe now and let us know which are you favourite movie deaths and why, then design a death and submit it to the forum. The best of the worst will make it into the final Film. We want the sickest, most twisted, gory and down right disgusting deaths you can think of so join us and commit celluloid slaughter. Join us in our quest to produce and release a fully independent British Horror film funded and created by members of this website. With support from legends such as Nicolas Roeg and John Landis and magazines including Bizarre and Gorezone we are spreading the word and need all of you film fans to subscribe now and help make this film! In the exclusive members area you can see the work of our subscribers and get involved with the production in a ground breaking way. Watch out for my upcoming interview with Devon-Cornwall Film talking about The 10 Pound Horror Film and a future piece on producing independent films. Join now to check out the film scores of our latest member Franck Trebillac a composer and motion designer. His awesome track Agent Orange is a cutting edge modern Horror theme, subscribe now to hear it in glorious stereo. Members can keep up to date with the development of the film, interact with other Horror fans and offer support and input on the project. 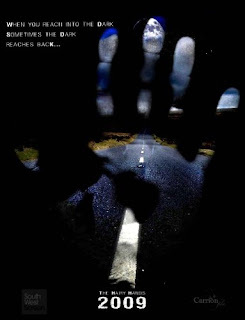 Members also get updates on the other films of the award winning Producer and Director behind The 10 Pound Horror Film including the upcoming Horror short 'Hairy Hands' Produced for South West Screen by 10 Pound Horror creator and Producer Tom Atkinson and long term 10 Pound Horror member and Director Ash Thorpe, teaser poster below. Subscribe now to be a part of the most exciting Horror film production in the world. Support for The 10 Pound Horror Film continues to grow with subscribers around the world. Our goal is to produce a cutting edge modern British Horror film with the help of all you Horror fans out there! 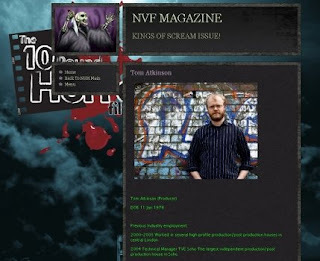 I am interviewed in NVF magazine next months Kings of Scream issue about the project and hope to gain further coverage in the US Indie film press in the soon. If you want to be a part of the most exciting Independent Horror film on the web then sign up now. Join us and alongside legendary film directors Nicolas Roeg and John Landis support the next generation of Horror film. Hats off to director Pascal Laugier for his astounding film Martyrs. This incredibly involving film takes a very clever and dark look at man’s desire to understand death. More films like this need to be made and we need your help and experience so join now and help make The 10 Pound Horror Film! This summer looks to be a real spine tingler with some great looking Horror films coming out. I am most excited about Let the Right One In which by all accounts should be stunningly beautiful and damn nasty! 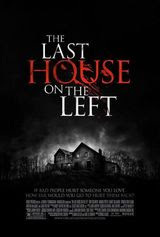 There is also the remake of Wes Craven’s Last House on the Left which will never be as disturbing as the original but should entertain and terrify never the less. To top it off Horror legend Sam Raimi is releasing Drag me to Hell (Great title) which promises to be a treat like his previous offerings. Horror fans have never had it so good but if you want to go further and be a part of the next big Horror film join this site and support British Horror. We need all you blood suckers out there to sign up and help us reinstate British Horror at the top of the hanging tree. 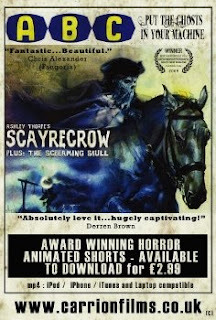 Join now to see more details of 10 Pound Horror Fiend, Carrion Film's fantastic Media Award and read Director Ashley Thorpe's interview with Fangoria here - see his poster for the film below. Pick up a copy of the righteous Death Ray magazine this month to read the exclusive interview with me about this hugely successful production and find out details of my recent Film Festival nomination! If you want to work in the Horror industry in any way, get in touch with me as I want your support and input in this project. When you subscribe to this site for only 10 pounds, you will get the chance to tell me about your work and your passion for all things blood and guts and be involved with the making of The 10 Pound Horror Film!